1) Building the lowest-noise enclosures has always been a prime Magico goal. You started with flat-topped, boat-tail-curved birch ply and aluminum boxes with the Minis, migrated to more traditionally squared-off damped aluminum enclosures with the Qs, re-introduced curved side panels in the two-piece S’s, and starting with the M Project have now turned to a gently arched carbon-fiber side panels with (in the M6) edgelessly rounded aluminum faceplates, top plates, bottom plates, and spines. This progression in materials and geometry raises several questions. First, although damped aluminum has been a constant for front and back panels, you have played with other materials for the side panels. What led you to settle on carbon fiber? What advantages does it have that aluminum (presumably) doesn’t? Does mating disparate materials create acoustical issues, in the way of different material colorations (and if so, how are those dealt with)? Do you use the same elaborately bolted together “skeleton” found in the Q Series for internally bracing your new box? Second, the M6 is almost elliptical in shape—your most aerodynamic effort (and your handsomest design, IMO) yet. Since smooth edges and curved surfaces (sides, tops, bottoms, and backs) obviously reduce diffraction (and with it the sense of hearing a speaker in a box), why did it take you so long to implement this geometry in your top-line enclosures? In addition to considerably lowering diffraction, what else have you gained by doing so? And does your new box measure any differently than your previous efforts? It has always been my goal to build a diffractionless enclosure. I actually built my first, organically shaped, edgeless loudspeaker over 25 years ago (http://magico.net/redefine/legacy.php top left in first Legacy picture). The problem, however, always lies in the materials used to build such a box. In order to achieve these kinds of shapes, you can resort to either molding, which is typically done with materials that are simply not stiff or rigid enough to be properly used as a loudspeaker enclosure (although metal can be used as well, but at immense cost, poor finish, and unreconciled damping challenges), or machined, or extruded aluminum parts that can be more easily dampened. We have done the latter, to various degrees, in both the Q (a rounded front baffle), and S (sides and tops) Series. In the new M6, through the latest advance in composites, we finally found the perfect solution to this tremendous challenge. A skin that is both extremely stiff and well damped, moldable to any shape we design. The only “weak” spot for such a structure is bolt coupling. You really don’t want to bolt directly, or through inserts, anything that require high-torque fastening. For that, as in the past, we use our unique aluminum clamping apparatus, where the drivers are bolted directly to the aluminum plates encapsulating the carbon skin. The aluminum then, throughout our unique rods contraption, sandwiches the carbon without the need of direct bolting. In the M6, we actually went further and built a 3-axis aluminum cage to encapsulate the carbon skin. The M6 is also the first speaker we built where all its aluminum outer parts are edge-free (i.e. have no corners), including the base. An immense effort given the fact that in order to achieve these unique shapes, some of these aluminum parts were 4” thick. In addition, this combination of ½ solid carbon skin encapsulated by the aluminum cage produces, by far, the “quietest” enclosure we, or anyone else for that matter, ever built. (The company who builds these carbon marvels for us also builds nuclear submarines in a similar manner, and these, as you can imagine, need to be “quiet.”) All these attributes are both measurable and audible. With the M6 we came as close as possible to building an “invisible box,” which is the ideal loudspeaker enclosure. Of course, let us not forget the reverse horn-shaped midrange enclosure, which is also made out of carbon, but with a different, much higher damping factor. 2) In addition to building low-noise enclosures, Magico prides itself on the development of highly linear, low-distortion/high-excursion drivers. Tell us about the drivers in the M6. How do they differ from those in your first M Series speaker, the standard-setting M Project? In particular, what have you done to make your diamond-coated beryllium tweeter, which in the past has “stuck out” a bit (IMO), blend so seamlessly with the graphene midrange? Has the new enclosure played a role in this? Has there been a change in your crossover between tweeter and midrange? Are there significant changes in the motor systems powering these drivers (and the woofers)? The M6 uses a refined version of the tweeter used in the Q7 MK2, improvements are due mainly to small details that do make a big differences, specific usage of glue type, a new gluing robot used to make every tiny step accurate to the level of a fraction of a mm. The bass driver incorporates the huge underhung motor system used on the Q7 MK2 12” drivers, tuned to match the M6 enclosures and maximize bass quality and quantity. 3) Much is made of time and phase alignment in loudspeakers. We see everything from DSP’d drivers to fixed staggered arrays to articulating boxes capable of minute adjustments. How does Magico handle the issue of time and phase alignment? Trying to keep things simple, let me just highlight the two MUST conditions where such concepts are even probable: 1) a first-order acoustical crossover, i.e. a perfect 6dB-per-octave acoustical slope from the designated bandpass; 2) a physical alignment of the drivers’ acoustical centers, which, unless a concentric driver is used, is only possible for one point in space at a time. Only if both conditions are met is time/phase coherency even probable. Just moving drivers around will not suffice to achieve time coherency. In fact, such designs will ensure a “non-optimal condition” at any point due to the fact that, if a first-order XO is not used, any driver movement will require XO realignment to keep the proper phase relations among drivers at the XO points. There have been honest attempts at such designs, including some that do meet the basic conditions; however, even if these criteria are met, the compromises needed to be taken to achieve these conditions are detrimental to overall sound quality. Staggering drivers, in order to align them, in a stepped baffle creates tremendous amounts of diffraction. Unlike time/phase coherency, which has never been proven to be a factor in perceived sound quality, diffraction has indeed been proven to be a big detraction. A 6dB-per-octave acoustical slope requires a very complex XO, with many parts, which also cause degradation in SQ and by themselves introduce time delays (that is why the actual notion of a truly time-coherent passive loudspeaker is questionable). A simpler XO is possible using non-psionic drivers, at the cost of losing low-level information and increasing distortion due to non-pistonic cone movement. Moreover, with 6dB-per-octave slopes in a typical three-way design, the bass drivers will be only ~18dB down at 2kHz, playing right into tweeter territory. Not to mention the tweeter playing into the bass region. 1) Big increases in IMD (intermodulation distortion), which clearly affects SQ. 2) Increased 2nd and 3rd harmonic distortion due to shallow crossover slopes. 3) Drivers firing at the listening position asymmetrically—i. e., off-axis (the need to “tilt” drivers to aim at listening position). So, weighing all these trade-offs against the fact that it has never been proven that time alignment is essential to SQ, time/phase alignment/coherence as a goal in loudspeaker design is easy to pass. 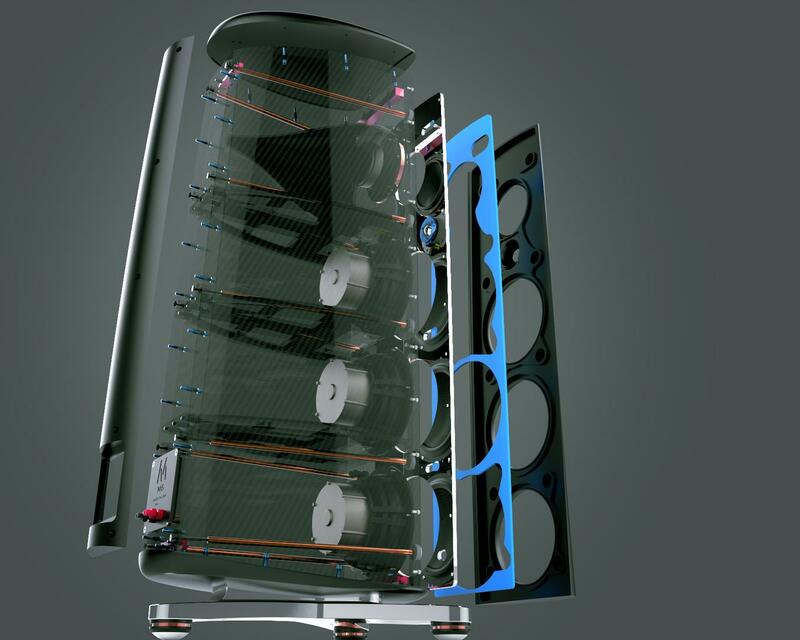 4) DSP’d and/or powered loudspeakers are a small but growing sector in the market. Do you see advantages to either or both that cannot be gained by conventional means? And do you see Magico eventually proceeding in either or both of these directions? We use DSP in ours subs in order to have better room integration than what is possible in a passive system. However, we have yet to hear any form of DSP that can preserve the basic qualities and transparency of a truly well-designed high-end system. Rest assured that we will continue to look. 5) The M6 is your finest effort yet—and the best dynamic loudspeaker I’ve heard. How are you going to top this?